Where is Tintin? Where is that brave boy reporter from Belgium who uncovers international conspiracies and corrupt corporations? Tintin was a model reporter who thoroughly and boldly investigated his story. He is there on the spot investigating through coups, international crime and scientific expeditions. Now the world needs Tintin more than ever. Now, when daily newspapers in major cities are closing down, or in Melbourne’s case now only in a tabloid format. Now, when sports, business and entertainment reporting is being automated. Now, we need the voice of the young boy reporter. Who didn’t dream of being Tintin and what are you doing about it now? Now, anyone can be a reporter and there are a million stories in your city waiting for you to write them. You might not be able to bring down dictatorial regimes like Tintin – but the opportunity is there. Even if you are not bringing down governments there are the usual journalistic thrills of finding a story, of being the first to report on a story, of finding that your story’s Google ranking is just below the Wikipedia entry on the topic. The need for real reporters, or citizen journalists, is greater than ever. The world needs more people to act like Tintin and examine the actions of the state and corporations. To report first hand rather than to rely on media releases and media managed events. We need a greater diversity of voices and we need to cover a greater diversity of subjects. Bloggers are accused of doing thing that the media does it just as often: lack of fact checking, lack of copyediting, copy and paste… It is said that we live in a copy and paste culture, where content is endless compiled from media releases. These accusations and common faults are evidence of the desperation of reporters/bloggers in these times. And where is Tintin? Well, what do you think happened after he didn’t get paid for all those stories? On the expedition in The Shooting Star, Tintin is described as “the young reporter who will represent the press” (p.14) but we never see him writing a story, even in the final radio news report there is nothing about his story on the Sãn Rico financier that attempted to sabotage the expedition. It is never clear if he a freelance writer or is he on the staff of a newspaper or magazine. You never see Tintin sending invoices or going to editorial meetings. You never see the sponsorship that Tintin needs to pay for his expeditions. The actual cartoon Tintin is a different matter, it is still very profitable and in 2015 there was a court case over image rights. When I was busy finishing my last book Sculptures of Melbourne my wife asked me what my next book would be. It was not the question that I wanted to hear then but she did help me work through a few ideas. It was worth asking the question because it was the same question that my publisher asked me just after my book launch. Fortunately by then my wife had helped me find an answer and my publisher liked the idea. My next book will be A Brush With the Law, stories of true art crimes in Melbourne, or some title like that; I don’t have a deep commitment to titles because my titles have often been changed. It will be published, whatever the title is, by Melbourne Books in early 2018. To keep to that schedule means finishing writing the book in the next couple of weeks. Then will come meetings with the editor, the copy editor, the book layout designer and eventually the person doing the publicity. For more clues about the content of the book see my blog post from last year. I have no ideas for another book after this one. I don’t even have ideas to reject and I don’t want to think about that now. Perhaps I will find it writing more blog posts, exploring the city or taking with someone. It is not going to be about taking a walk there are too many people writing books about walking. The best of these books is Frédéric Gros A Philosophy of Walking (translated by John Howe, Verso, London, 2014); this is not ‘philosophy’ as in ‘new age nice thoughts’ but the rigorous hard thinking of Kant, Nietzsche and the ancient Cynics in relationship to ambulation. Not that Gros has written a dense academic examination, it is an entertaining read, but chapters about Ghandi, Rousseau or Rimbaud walking is about as light as he gets. I haven’t been posting on this blog as often as I usually do because I am working on my book. However after all these years of writing this blog I don’t want to give it up because this is where I get many of my ideas. Today is the anniversary of my first book launch (insert plug for Sculptures of Melbourne here). Recently I passed several other milestones. Earlier this year I posted my 1,000th blog post. And now this blog has had over 500,000 total views! Thanks to everyone for reading it. Cheers! The author trying to look through Andy Warhol’s eyes with a sleep mask from the Warhol/WeiWei exhibition gift shop. I have started researching my next book about art and crime. There are many true stories at this intersection between two worlds, stories involving art thefts, art forgery, vandalism of art, vandalism that is art and criminals who do art. If you want to contact me with information about art involving crimes or crimes involving art in Australia I can keep your identity confidential. I was able to post an early draft about courtroom sketch artists but I will not always be able to do that. I can’t blog about some of my current research into art and crime, so you will have to wait and read about it in my next book. For this and other reasons, that I will describe as R&R (research and relaxation), I will be taking a short break from posting on this blog. I feel that I owe my regular readers a note explaining the absence of any blog posts rather than simply vanish and leave them wondering what happened. I hope to be posting my usual mix of exhibition reviews, street art notes, public sculpture history and other items about Melbourne’s visual arts culture in a little over a month. Peter Tyndall’s blog, bLOGOS/HA HA is blogging as contemporary art; there is always an enjoyable conjuncture of images on it and it forms part of his greater work. In 2013 bLOGOS/HA HA was in the NGV’s Melbourne Now and Reinventing the Wheel; the Readymade Century at MUMA. I’m pleased to see it represented in exhibitions where it is displayed in physical (paper) and virtual (computer) forms. I’ve had bLOGOS/HA HA on my blogroll for years. This title was often accompanied by a schematic representation of the painting, a square with wire hangers (the hanging system of the galleries at the time) and a viewer, generally a family standing in front of it. In the 1980s Tyndall had refined his title further adding, a line space as in the chorus of a song and then, what Tyndall refers to as the “meta-Title”, LOGOS/HA HA in upper case. Tyndall played with his “meta-Title” in the title of his blog; considering the entomology of ‘logos’ and ‘web logs’ (as blogs were originally called). There is a poetry to Tyndall’s title and repeating image. It is part of the post-modern experience, the endless quotation, the paradoxes, the hermeneutical elements building up meaning through repetition. Combining the conceptual and the visual in a sophisticated post-modern understanding of the image and communication. Tyndall works in all media and his blog is a hyperlinked extension of this exploration of media. Blogging appears like the ideal for Tyndall’s art. Is bLOGOS/HA HA in one media or multimedia? This is the kind of links, interconnections, indeterminacy and paradoxes that Tyndall delights in. Blogging presents another paradox to Tyndall, the private and the public. 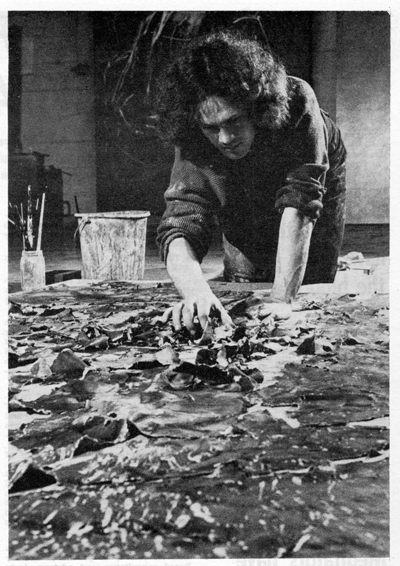 His art never expressed the private individual; all that the Melbourne Now exhibition guide notes “1951 – :born at Mercy Hospital, Melbourne, The World”. Tyndall reconciles this by posts on exhibitions, current events and protests in the art world (I learnt about the protests about no sketching at the NGV from his blog and wrote my own blog post). This is mixed with posts on Tyndall’s own exploration of repeating images of people looking at things, including art.